So really how did he make this comeback? Not that I have already obtained all this, or have already arrived at my goal, but I press on to take hold of that for which Christ Jesus took hold of me. Brothers and sisters, I do not consider myself yet to have taken hold of it. But one thing I do: Forgetting what is behind and straining toward what is ahead, I press on toward the goal to win the prize for which God has called me heavenward in Christ Jesus (Philippians 3:12-14 TNIV). There are all sorts of "secrets to success" lists in circulation. There is probably valuable truth in each of them. Commons threads of optimism and creativity, perseverance and hard work are always there. Yet not so many mention sheer dumb luck or people who give breaks to untested souls. 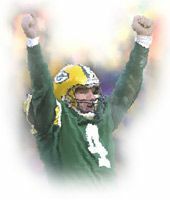 Brett Favre is a great illustration of still another secret to success that tends to get overlooked. I call this a "distressing" secret for the simple reason that most of us have enough pride that we resist the path that always includes it. Favre has been in the NFL since 1991, but the past couple of years have not been stellar. Some sportscasters wondered aloud if he might just retire. In an interview with an ESPN announcer in 2006, he even said he was leaning toward it. He not only came back for the 2007 season, as it turned out, but he has come back with fire and proficiency. The Packers are in first place in their division with an 8-1 record. At a personal level, Favre holds some very enviable records. He has the most career starts of any NFL quarterback in history. And, on September 30 of this year, he broke the record for most touchdown passes. But, just two weeks after breaking Dan Marino’s record for the most passes thrown for touchdowns, he went on the field and broke the record for the most passes thrown for interceptions in the National Football League! That record doesn’t get a trophy. "Life is either a daring adventure or it is nothing." You have to risk defeat in order to win. You have to run the risk of failure in order to have the opportunity to succeed. In order to pass for a touchdown, you have to hazard being knocked on your backside. Entrepreneurs know what NFL quarterbacks know. And so do people in love. The issue here is not foolhardiness. Someone without basic skills and good training can’t play football, run a company, lead a church, or negotiate a relationship. No one should be too proud to ask for help. Good leaders do their homework and prepare well. But the moment comes when you actually have to step onto the field, call a play, and run the risk of failing. Maybe the people are right who say it is fear that prevents success. But my sneaking hunch is that fear masks pride. More specifically, someone’s pride keeps her from taking the risk that could prove awkward and embarrassing. "Security is mostly a superstition. It does not exist in nature, nor do the children of men as a whole experience it," wrote the late Helen Keller. "Avoiding danger is no safer in the long run than outright exposure. Life is either a daring adventure or it is nothing." Brett Favre must feel the same way. "A Distressing Secret to Success" by Rubel Shelly is licensed under a Creative Commons License. Heartlight encourages you to share this material with others in church bulletins, personal emails, and other non-commercial uses. Please see our Usage Guidelines for more information.